This Lohri, amp up your beauty statement with these awesome braid hairstyles for an ultimate ethnic look! Punjabi women are known for their gorgeous long hair and the lovely braids they wear. This is why, as Lohri approaches and now that you are busy thinking about what to wear for the evening sagas you have been invited to, don’t forget to wear your hair in braids. 2016 showed us braids worn by celebs and fashion models from all over the world, and we are here to show you some more awesome braid hairstyles for Lohri nights to look chic and doll up the hair in. Take a look! 1. The one sided messy wavy long hair braid that can be worn with ethnic to Indo-western wear. 2. The headband hair braid that can be worn for a casual night out with the girls. 3. The bohemian side swept braid that can best match a Patiala salwaar suit. 4. The romantic French braids which best suit teenagers and teen boppers at the Lohri bash. 5. Parallel double braids with a volumnizing twist for the lady that loves to flaunt her long tresses. We did show you how to braid your hair in various styles for girls and women with long hair. Let us now take a look at braided hairstyles that best suit women with medium length hair. Here are five awesome picks! 1. Gorgeous messy wavy ponytail braided hairdos for the elegant cocktail Lohri events you have been called to. 2. 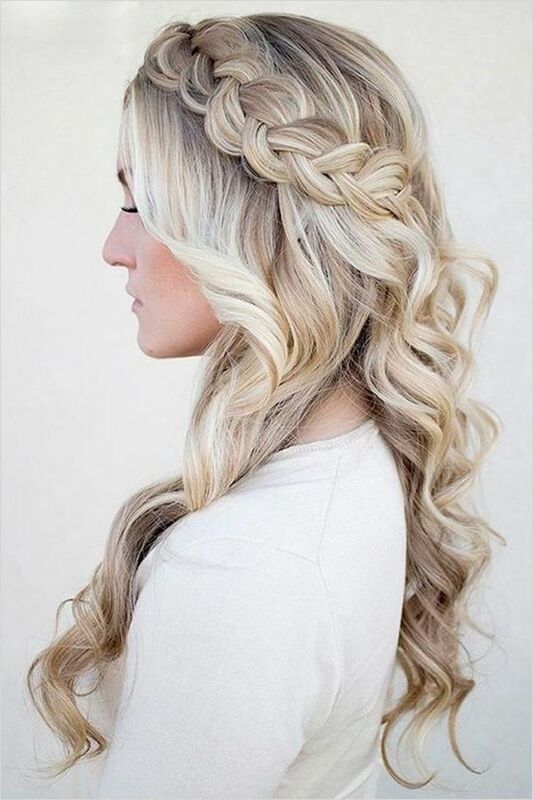 Messy romantic curly braids for women with coarse medium to wavy medium hair length. 3. Braided romantic buns for the very elegant and black tie evening dinners this Lohri to wear at. 4. Romantic princess medium length waterfall braids side-swept for the young lass that knows her jazz. 5. A pretty flower braid updo which defines the epitome of feminity on your hair and can be worn with just about any ensemble for the evening. No need to worry if your hair is short and yet you would like to flaunt the braided hair updo or hairstyle, because there are many that you can choose from. Here are five simple and very pretty ones to take inspiration from. 1. The Grecian braided updo for women with short hair and yet with a look of elegance much needed to flaunt. 2. Gorgeous wavy swept waterfall short hair braided styles to wear with your Indian outfits for the evening. 3. Tri braided updos for the elegant lohri night to flaunt a formal look at! Can be worn with Indian ethnic wear or western wear too..
4. Intrinsic mohawkkan braided updos for the evening so glamorous to flaunt at. 5. Messy wavy side waterfall braided short hairstyle for PYTs that want a chic touch. Be braidy gorgeous! Here are more options..